With the recent hail storms in Colorado Springs, HOA communities are assessing damage and often passing the costs onto the homeowners. If you live in an HOA community, special assessments could be mandated to homeowners often costing you thousands of dollars unexpectedly. 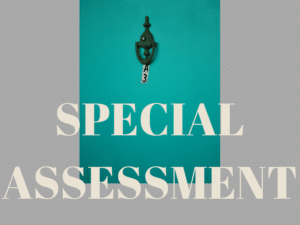 Why Would an HOA Charge a Special Assessment? Typically, these are one-time required payments by each homeowner. Special assessments can be collected for general maintenance of a complex or shared community space (such as painting, roof replacement, paving shared driveways, etc), but generally these assessments follow a “sudden and accidental event” such as a hail storm, fire, or other type of loss. Sometimes the HOA will allow owners to pay in a few payments for larger amounts, but either way, we’ve seen special assessments as high as $7,000 per unit (owner). If you’re an investor and own multiple units, it could be a huge financial obligation that forces you to scramble to figure out how to pay your share. What Can Homeowners Do to Protect Themselves Financially? One option to be prepared for a special assessment is create a savings account for HOA fees and assessments. Just like your HOA, you should have some reserves to pull from for the unexpected expenses. However for many of us, this isn’t practical or attainable. Perhaps the easiest and most immediate solution is call your homeowners insurance agent today! Ask about the Loss Assessment Coverage and find out if you’re covered and your coverage amount. Some policies automatically include this coverage, but the default coverage amount is very low and most likely should be increased to assured you have proper coverage. Carl Adams, owner of Red Letter Insurance, says, “I typically recommend going with the highest coverage offered” because the additional coverage is so affordable. The Loss Assessment Coverage is very inexpensive (one client got $50,000 worth of coverage for $85 per year) but is worth every penny. Basically, if your HOA creates a special assessment, you file a claim with your insurance company under the loss assessment coverage and after you pay your deductible, your homeowners policy covers the remaining cost (up to your coverage amount). What Are the Pros and Cons of Adding Loss Assessment Coverage? If your HOA determines to charge a special assessment to the owners, your loss assessment coverage could cover any additional amount after you pay your deductible. But keep in mind, it is considered a claim on your policy. Adams recommends, “Talk with your insurance professional about what makes the most sense.” Sometimes, filing a claim, although it will pay for the single incident, may not be the best option if it increases your rates, stops your claims free cashback perks (with some companies), or makes it difficult to shop around for insurance because of a past claim. Keep in mind that HOA’s are usually set up in condominium and townhouse complexes, and the Loss Assessment Coverage typically applies to HO6 Insurance Policies (the type of policy you’ll typically get for a condo or townhome). But it can also apply to single family homes in a Homeowners Association. Check with your insurance broker or agent to verify your type of coverage and coverage limits. For more information, contact your favorite real estate agent or insurance agent.